Derry Minor manager Paddy Campbell. 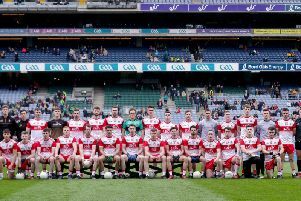 Derry minors footballers' All Ireland dream was ended by Meath in the Athletic Grounds on Saturday despite a superb second half display that threatened to produced a memorable comeback from a gutsy Oak Leaf team. After their controversial Ulster final defeat to Mongahan, Derry were slow out of the blocks and second fiddle to an excellent Meath team for most of the opening half but all that changed at half-time as Derry kept the Royal scoreless for 25 second half minutes, bring the game back to one point but crucially watching three goal chances slip the wrong side of the post. Substitute Conor McAteer also watched his effort which would have levelled the game strike the post with five minutes left. The Oak Leafers lined up without the injured Tiarnan Woods in front of what was a Meath dominated crowd in the Athletic Grounds. Conditions were difficult after hours of torrential rain which at one point threatened to see the fixture postponed and both teams deserve credit for the standard of football they served up. If the weather posed a big problem, Meath's first half dominance was the main concern for Paddy Campbell's team with a 'six point' swing at the end of the opening half helping the Leinster champions to a 1-10 to 0-4 lead, Derry registering only one point from play in the opening 30 odd minutes. That could and should have been different had Ethan Doherty managed to hit the net as the clock ticked into the 30th minute. Misjudgement in the Meath backline sent the Glen man clear and travelling at pace, he probably should have side-stepped Sean Braqnnan in the Meath net but he opted to take his shot early and with Brennan producing a brilliant block an great opportunity was lost. That miss looked even more expensive less than 60 seconds later when a flowing Meath move saw Adam Reilly send dangerman Luke Mitchell in on the left and he made no mistake, shooting the Royal County into a commanding interval lead which Bryan McCormack's late point only added to. It was cruel on Derry but little more than the Leinster champions deserved after an impressive first half in which Derry struggled with their kick-outs. The Oak Leafers did have plenty of chances but the conditions meant kick-passing had to be very accurate and Derry too often kicked ball away when there was no need to. In contrast, Meath's short passing support game was allowing them to hold possession and cut through Derry despite handling being very difficult. Indeed Meath signalled thier intention after only 13 second when, straight from throw-in, Adam Reilly stormed through to tap over the bar. When Enda Downey was fouled, Conleith McGuckian's free brought Derry level but further points from Luke Kelly, Cian McBride and Darragh Swaine gave Meath a three point advantage. Derry responded well with two frees from Downey but Mitchell and Swaine quickly restored Meath's three point lead by the 18th minute before David Bell pushed it out to four with his first of the game. Too often Derry's game was breaking down on the Meath 45m line but the young Oak Leafers were keeping themselves in the game. When McGuckian's free brought it back to a three point game, Derry were looking in control for the first time in the half only to see Kelly and Mitchell stretched the lead back to five. Doherty's chance should have chance the complexion of the half but Brennan's save coupled with Mitchell's goal left Derry with a mountain to climb in the second half. Meath started the second half as they had the first, Mitchel this time the man to point inside the opening minute of the half but thereafter Derry started to find the sort of form they had shown throughout the Ulster Championship. An unanswered 1-06 turned the game on it's head and should have put Derry in a position to win the game. Points from McGuckian (2), Downey (3) and Doyle had Derry right back in contention before Downey was hauled to the floor by Meath full-back Harry O'Higgins who was black carded. McGuckian stepped up to hit the net and the game was there was Derry. Crucially McAteer then watched his effort hit the post before taking the wrong option on a second opportunity. It was the latest in a line of missed chances, both for points and goals, that Derry's performance didn't deserve but Meath took full advantage. Within seconds of McAteer's chance, Mitchell struck a vital free to push the Meath lead to two. Derry came again but the effort they had expanded second half was catching up on them and further points from Costello and two more Mitchell frees, both moved forward by the referee, saw Meath over the line. It was a cruel finale to an excellent game but one, despite the disappointment, that should give these young Oak Leaf players every encouragement as they seek to build on a year which has seen them play some superb football. Derry: Aidan Gillen, Eoin McKeever, Aidan McCluskey, Ronan McFaul; Jamie Dougan, Johnny McErlain, Adam Canavan; Niall Doyle, Iarlaith Donaghy; Eunan McElhennon, Conelth McGuckian, Ethan Doherty; Eoghan Hawe, Enda Downey, Conan Milne. Meath: Sean Brennan; James O'Hare, Harry O'Higgins, Cathal Hickey; Conor Farrelly, Sean Coffey, Oisin McCloskey; Adam Reilly, Cian McBride; Darragh Swaine, Matthew Costello, Bryan McCormack; David Bell, Luke Kelly, Luke Mitchell.